For those who must run far, the New Orleans Marathon should be on their list of events. Actually the full title is the New Orleans Mardi Gras Rock 'n' Roll Marathon. It takes place later in the year in winter when it is warm – rather than hot. Personally, I subscribe to a friend’s theory that if you have to run, you left too late – but Emil Zátopek is right about the New Orleans Marathon being an experience. In New Orleans people of the same viewpoint as myself can also be seen enjoying that experience. First come the Marathon stars – serious runners who come from many different continents to race here. On their heels are the aspiring challengers. These over exerting bodies are followed by those sensible enough to know it is hot and humid – and that by definition any marathon means running a long distance. They accordingly set out at a manageable pace - most just strolling. 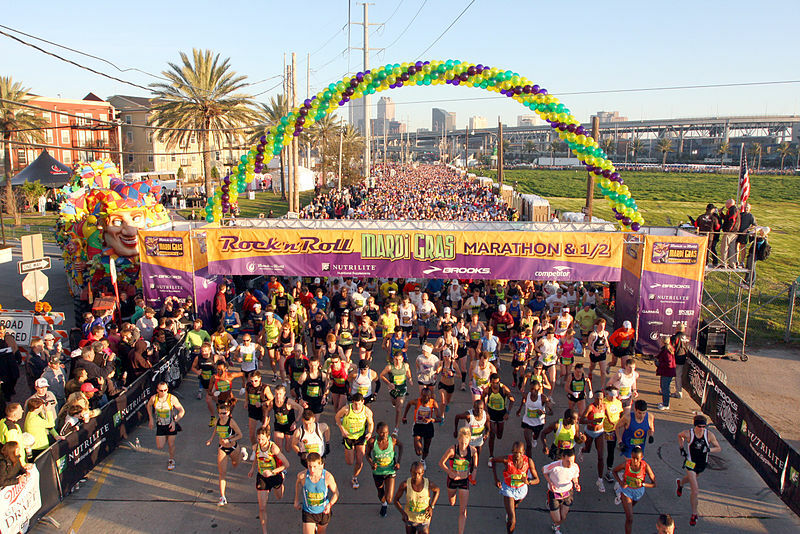 Runners come from around the world to run in the New Orleans Marathonal although the race is flat and relatively unchallenging. It is sought after for its beautiful course – through the French Quarter, the Garden District and lovely Audubon Park - and also to experience the New Orleans sense of celebration of life. Of course there is a legendary 'After Party' of the New Orleans Marathon. It is a typically New Orleans Mardi Gras style event for all participants, held at the Superdome. 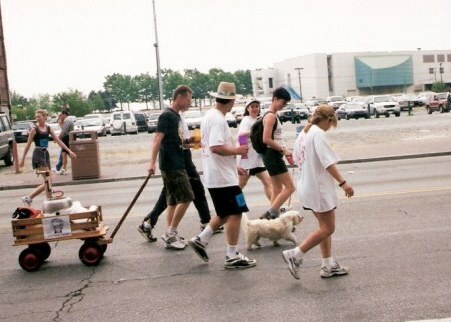 On the basis that all can participate in a festive event (typical of New Orleans – see my comment on the marching girls of Mardi Gras), there is a category specially for walkers, who set off with supplies, and sometimes acompanied by the family dog. 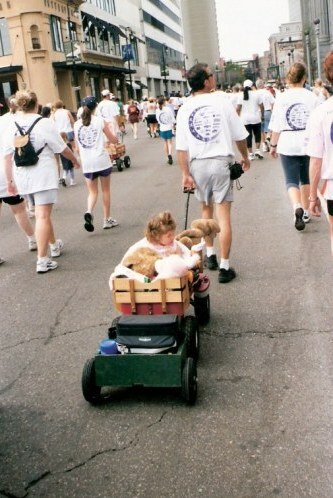 There are children in wagons – and they with their teddy bears. There are some great stories about runners. During the Sydney Olympics, Kenyan-born Kip Lagat – who holds world records in 5000 metres road, 10 miles and 20,000 metres on road (but after emigrating to the Netherlands now runs under their flag), responded to the question so many have asked about why there are many outstanding Kenyan long-distance runners. He said it was due to the road signs: 'Beware of the Lions'. Joking aside, she also tells that before leaving Kenya, she was out training one night when she heard a noise behind her and found herself being followed by a leopard. I like this part. She was followed by a leopard. A leopard can run at 64 kph (that's about 40mph). How fast was she running? At any rate she threw stones at it, and it departed. Personally I think it was just embarrassed at being outrun. but experience it for yourself at your own pace. Where else but in the New Orleans Marathon do you find a race category for walkers – and where everyone gets a medallion – just for finishing? If you jog backwards, do you lose weight?